, visiting with friends, listening to music by Ben Baldwin + Kent Allyn, and sipping an ale (a Grisette) brewed especially for the occasion by Throwback Brewery. In addition to the main exhibition on the first floor, “Gertrude Fiske: American Master”, two companion exhibitions are located upstairs: “Seacoast Masters Today” featuring Amy Brnger, Donna Harkins, Sydney Bella Sparrow, and Pamela DuLong Williams; and “Sisters of the Brush and Palette”featuring Fiske contemporaries - painters Anne W. Carleton, Margaret J. Patterson, and the notable Portsmouth artist, Susan Ricker Knox. All three exhibitions are open to the public April 6 - September 30 at Discover Portsmouth. 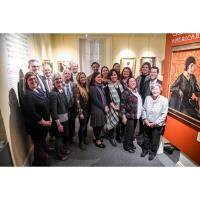 Founded in 1917, Portsmouth Historical Society is a nonprofit devoted to championing the history, arts, and culture of the Portsmouth region through acquisitions, preservation, museum exhibitions, programs, and publications. Our exhibitions are free and open to the public. Memberships, Visitor Donations and Museum Shop purchases - including a 108-page Gertrude Fiske exhibition catalogue - help support our nonprofit programs, collections, and services. Discover Portsmouth is open daily, April 1 - December 23 from 9:30am to 5pm. PortsmouthHistory.org or call 603-436-8433.